A Preauthorization is an amount placed on hold on a credit/debit card until the merchant finalizes the amount. 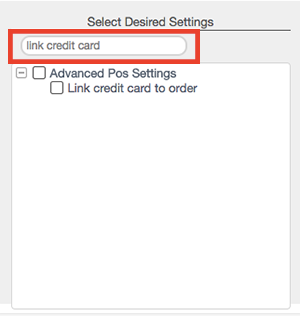 Preauthorizations can be used in the Revel's Link Card to Order feature. This feature allows bartenders/waiters to easily pull up a customer's tab/table by swiping the customer's credit card, as opposed to selecting the tab/table on the screen. It is possible to link a customer's card to a bar tab with or without a preauthorization. By using the Link Card to Order feature, the bartender/waiter can have the option of returning the card back to the customer after linking it. Since the credit card information is linked to the order, it is possible for the bartender/waiter to close out the order without the card at anytime. However, by keeping the card the bartender/waiter can easily pull up the customer's order by swiping it. Linking cards to bar tabs/tables with preauthorizations can be used for businesses that want to verify that a customer's credit card is valid. Note: Only USAePay, Intuit(1526+), Mercury, TriPos and Freedom Pay work with preauthorization or card linking. Only available for Table Service and Quick Service clients. Quick Service only allows linking cards to orders, it does not support preauthorizations. If you are a Quick Service client, please open a tickcet with Revel Support for additional assistance. To see how preauthorizations and link card to bar tabs/tables feature works on the iPad POS Platform go to Preauthorizations/Link Card to Bar Tabs/Tables on the iPad POS Platform. Click the Settings link in the menu at the top of the page. Now you can preauthorize cards and link them to the customer's order! Note: For bars make sure that the Bar Tabs setting is enabled. 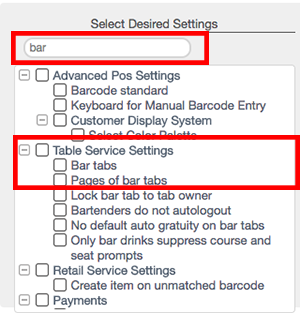 You can adjust the number of pages of bar tabs at the setting below labeled, Pages of Bar Tabs. When the Link Card feature is enabled, there are various settings for preauthorization. Allow Preauthorization: Enable this setting to allow preauthorization when linking cards to a bar tab. If unchecked, linking a card to a tab will not prompt to place any preauthorization onto the card. It is possible to set the preauthorization amount in the "Preauthorization Amount" setting. The bartender/waiter will still need to confirm the preauthorization, but also can manually type in a different amount. Automate preauthorization: Enable this setting to automatically place a preauthorization amount. For this setting to function, it is necessary to enter the automated preauthorization amount in the setting "Preauthorization amount." As soon as the card is swipe, the system will automatically preauthorize it for the set amount. Preauthorization amount: Set the amount Revel will preauthorize on the card when linking the card. If this setting is at 0 the "Automate preauthorization" setting will not function, and the "Allow preauthorization" setting will require the bartender/waiter to type in the preauthorized amount each time. Refresh your POS for the features to be available.